EVER SINCE THE PUBLICATION of Jared Diamond’s Guns, Germs and Steel (GGS) by W.W. Norton in 1997 and Vintage UK in 1998, critics have panned the text for a number of historical “sins.” These accusations have ripened over the two decades since the book’s release. Today, they invite reconsideration of GGS in light of present concerns. This review aims to do just that: it contends that readers ought to take a closer look at the nature of Diamond’s essentialism, rather than slather Diamond with accusations of “geographic” or “environmental” determinism. And it reconsiders whether determinism is such “sin” after all. Lest we forget the critiques that have been made of the book, here is the shortlist: (1) that Diamond has written a history of encounter and conquest, not one of hybridization; (2) that he relies far too heavily on simplistic dualities, in particular, on an arbitrary division between “winners” and “losers,” or, as he puts it, those who “have” and those who “have not”; (3) that Eurasian “success” becomes the standard by which Diamond, at times, judges progress elsewhere in the world; (4) that his chains of causation are conjectural at best or are only backed up by inference, logic, and circumstantial evidence. Most of all, Diamond stands accused of (5) geographic or (6) environmental determinism. In my view, this is more than a little uncharitable, especially since Diamond himself acknowledges that human creativity and contingency might have, at all points, upset the flow of his narrative. That said, even if we wanted to convict him of this offence, we would first have to consider what particular brand of determinism he subscribes to and whether the labels “geographic” or “environmental” can be suitably applied in his case. Determinists come in a variety of flavors, after all. So where does Diamond fall on this spectrum of infamy? Before we can answer, we should first interrogate the implicit cartographic imaginary of GGS. The world, per Diamond, is an outline of landmasses superimposed on an ever-present reticule of longitudinal and latitudinal coordinates. The map is flat, uniform, clear, and comprehensible at a glance. Above all else, it is divided into continents, whether it is the “five habitable continents” that humans colonized one by one (Eurasia, Africa, Australia, North and South America) or the three major landmasses that are depicted as “tilted axes” in Figure 10.1. (Eurasia, Africa and the Americas). In the final chapter, Diamond lists four crucial points that, he believes, both summarize and explain the “broadest pattern of human history.” All four are, in fact, either explicit or implicit attempts to explain “continental differences” rather than fluid zonal trends – i.e. attempts to explain why “Africa” as a monolith is poor, rather than to explain why “western Europe,” as a subset of Eurasia and a malleable cultural zone, is rich. The specter of homogeneous, empty continents looms elsewhere in the work as well. A quick search for the term “continent” comes up with entries on 107 of the 448 pages of the digital version of GGS. Because he takes the existence of continents for granted, however, Diamond never has to provide his readers with a clear picture of where his all-important continents start and end. In some chapters, he treats “the Americas” as one conceptual whole, while in others he appends “North Africa” – which itself is a nebulous, presentist category – onto the Eurasian landmass. Although his prose does much to situate the reader, often one cannot help but wonder: “where in Eurasia?” (Or in “the Americas,” “New Guinea” or “the Fertile Crescent,” for that matter.) In the process, the reader grapples with one of the most beautiful yet objectionable aspects of this book – the fact that GGS is a masterful act of simplification, one that elides all of the curious rips and reversals in the grand cloth of history. A critical reader might think of a deeper question, however: “what impact,” she asks, “does this continental framework have on his conclusions?” First and foremost, it means that Diamond neglects numerous other metrics that affect how humans experience different terrains – elevation, soil composition, rain patterns, et cetera. He dedicates little space to monsoon cycles, desertification, and deforestation, even though these factors explain why agriculture emerged independently on the two opposite ends of Eurasia. Instead, Diamond most often depicts Eurasia as a consolidated hearth and a breadbasket, in a manner that both echoes and reinforces the controversial “heartland theory” that the geo-strategist H. J. Mackinder first elaborated in 1904. At the same time, the continental framework lets Diamond sideline the seas. He devotes entire chapters to land, domestication, and cultivation, but apart from a couple of sections about Polynesia, Diamond says precious little about the impact of oceans on the deep human past. This, in spite of the fact that in two of the four crucial “takeaways” of GGS, Diamond contends that some continents were more isolated or segmented than others and hence had slower rates of diffusion. The author needs to provide a better account of overseas interaction if he expects his readers to accept this claim: oceans, after all, can either divide or connect distant peoples, as the curious presence of an Austronesian language off the eastern coast of Africa perfectly attests. In this case, it is useful to compare the printed maps in GGS – most of which are Gall Stereographic Projections – to the textual map that Diamond weaves in and out of throughout the book. Often, the visual inserts center the massive liquid expanse of the Pacific and Indian Oceans, just as the narrative hones in on the Eurasian landmass. The dissonance between the visual and textual supplements continues on pages 96 and 288, where Diamond has placed photographic inserts of various human “types.” Next to snapshots of Ingrid Bergman, Nelson Mandela, and Emperor Akihito are prints with overt ethnographic overtones. At times, the geographic content of the photographs is purposefully left imprecise (“A Chinese girl” or “A Javanese woman”) even when it is clear that the source material provided more detailed information. This underscores yet another spatial trend in GGS that the author’s homogeneous, empty “continental framework” produces – simply put, it is a skew in favor of generality and abstraction above specificity and detail. One of the prints, in particular, stands out for further mention: it is the coarse, weathered image of Trucanini, one of the “last” Palawan Tasmanians, as photographed by Charles A. Woolley for the 1866 International Exhibition in Melbourne. 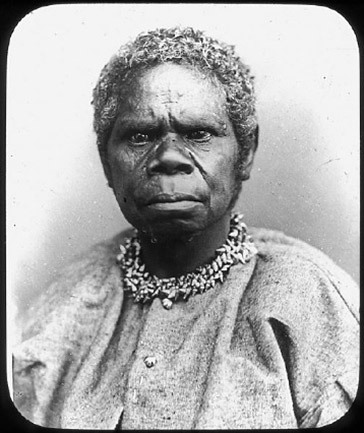 Trucanini is disrespectfully left unnamed in the insert, described only as “[an] Aboriginal Tasmanian woman, one of the last survivors…born before European arrival.” In her day, however, her likeness was shorthand for the mixed results of British settler colonialism – as an icon of a “vanished” race, Trucanini emblematized the defiance of the colonized Other, even as she attested to the near-inevitability of settler colonial victory. Her eyes, in particular, are hauntingly powerful: they fiercely contradict the neoclassical pretensions and scientific disdain of the photographer. This detail captures some of the human implications of GGS. Although Diamond eagerly defends the essential sameness of all people, oftentimes GGS falls short of a detailed and respectful treatment of various sensitive phenomena. His explanations of poverty, colonialism, and environmental degradation have left me more than a little disappointed. The reason for this is simple: Diamond’s tools are inept. He reproduces maps, photographs, and narratives that have overtones and histories that run counter to his purposes. Before we accuse him of determinism, it is important to remember to ask whether he could have done better. In some places, such as the photographic inserts, it is clear that he could have done more to contextualize his sources and purposes. Elsewhere, complicity with hegemonic narratives is a hazard worth the risk. It would have been extremely difficult for Diamond to tell a narrative of global scope without his abbreviatory approach. If he sounded geographically or environmentally determinist at times, so be it. Determinist undertones come with the terrain. We are left with the question of whether Diamond is an “environmental” or a “geographic” determinist. I’ll answer this in brief: my personal preference leans away from environmental determinism, as Diamond refuses to engage with a number of important climatic and ecological phenomena (mentioned above). Geographic determinism doesn’t quite fit the bill either – his account of geography and important geographical phenomena, like diffusion, leaves a lot to be desired. Perhaps it’s best to call this cartographic determinism, then. We can define it as the state of being chained to an imaginary map that transmutes and transforms one’s thought, even as one remains unconscious of it. Sergio Infante is a senior at Yale University. Diamond even uses the phrase “continental differences” twice in the topic sentences for this section. Her status as the “last” of her race is heavily contested. As of the 2011 Australian census, circa 20,000 people identify as Palawa.